Liz Harman (second from left), HERoes in Deed Executive Director, hands out commemorative Vietnam War coins to local veterans. On November 11, 2018, Veterans of Foreign Wars Post 4662 out of Warwick, NY held their annual Veterans Day Parade. Members of the VFW Post 4662 led by Dan Burger, Post Commander, marched through the traditional Warwick parade route alongside members of the American Legion, both Girl Scout and Boy Scout troops, as well as Town and Village officials. The parade route ended at the entrance to Memorial Park. Speeches by American Legion Commander Walter Vaughan, Town Supervisor Michael Sweeton and Mayor Michael Newhard remembered the men and women of the Great War in its 100-year anniversary and the Vietnam War’s fiftieth anniversary, and spoke of the appreciation for all men and women who have served then and now. Walt Vaughan also spoke of today’s Soldiers returning home and the need for the Government and communities to improve on taking care of all who have sacrificed so much for our freedom. Commander Burger invited everyone to visit Lewis Park and enjoy refreshments and a bouncy Castle for kids, donated by HERoes in Deed. The Old Baptist Meeting House was open to the public and displayed World War I artifacts including uniforms, quilts and other items. 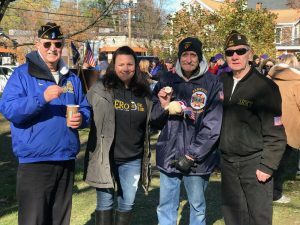 The day was a huge success and Commander Burger said he looks forward to the continued growth of VFW Post 4662 and the Veterans Information Center in Warwick in support of community Veterans and their families.